Mother blames 10 year old son for shooting dad. Unable to answer how her son got her gun. Says son was on Prozac. Father passed 2 Polygraph tests clearing him of false allegations of abuse. After a trial that some members called the saddest experience of their lives, a jury decided Thursday that a boy who climbed into his father's sport utility vehicle and shot him to death should spend 10 more years in custody. The verdict ended three days of deliberations in a Harris County juvenile court where the boy, now 12, was held responsible for the August 2004 slaying of physician Rick Lohstroh. But although they agreed last week that he "committed an act of delinquent conduct" in shooting his father, jurors said they thought about his best interests in deciding what should be done with him. Two of them, and the attorneys for both sides, agreed that he had been badly traumatized by his parents' bitter relationship. "We put him in a structured place where he could get psychotherapy and be away from his mother," said jury foreman Robbie Magness. The decision puts the boy in a Texas Youth Commission lockup at least until he is 16, when he could be moved to a prison. He could become eligible for parole in three years. His mother, Deborah Geisler, wept as she left the downtown Houston courtroom after hearing the verdict and did not speak to reporters. "I didn't expect that," said her husband, Matthew Swanson, who added that he and Geisler plan to visit her son soon.Later Thursday, however, after a visit to see her son, Geisler said the decision was wrenching. "I was absolutely devastated," she said. "There are things in your life, a parent's life, that are unbearable to hear." Geisler said she has taken responsibility for her part in the dysfunctional 13-year marriage that served as her son's primer on violence and anger. "Over my son's life the police had been called to our home 26 times," she said. "He saw his father arrested ... I was arrested also." She said the shooting also weighed heavily. "Yes, absolutely, yes. It was my gun," she said. After hearing the verdict, the boy's paternal grandparents, Richard and Joanne Greene, hugged. "Today is another tragic day," said Richard Greene, who was Lohstroh's stepfather. "There's no joy. There were no winners in the 315th Court today." Almost gave probationThe shooting took place after Lohstroh, a 41-year-old physician at the University of Texas Medical Branch in Galveston, went to his ex-wife's home to pick up the boy and his younger brother. Investigators said the boy got into Lohstroh's SUV with his mother's .45-caliber pistol and fired through the back of the driver's seat. Magness, a high school English teacher, said jurors were one vote shy of giving the boy probation at one point. They finally decided it was best to keep him in a youth facility away from his mother, said Magness, 38. "This case is the saddest thing most of us have been involved with," he said. Testimony showed that the boy had "as bad a home life as any child you have ever seen," Magness said. Fellow juror Lee Kennerson, a 69-year-old retiree, agreed. The boy, who was 10 at the time of the shooting, faced a sentence ranging from probation to 40 years in custody. "I think justice was served," said prosecutor Bill Hawkins. "It's sad that it has to be this way." Hawkins and fellow prosecutor Mia Magness, who is not related to the jury foreman, said the parents, especially Geisler, appear to have some responsibility for the boy's state of mind at the time of the shooting. The best way to help him, they said, was to place him in TYC and have him avoid contact with his mother. Hawkins said he asked for 20 years in TYC because the boy appears to feel no remorse. Defense attorney Chris Tritico said the case will be appealed. He said the boy, whom the Houston Chronicle is not identifying because of his age, suffered from psychosis brought on by 90 milligrams of Prozac he took weekly for anxiety and depression disorders. The boy also was traumatized by parental fights that brought police to the family's home more than two dozen times in seven years, Tritico said. He said Geisler "poisoned" the boy against his father. Tritico said the boy believed his father molested him, but Child Protective Services found no evidence to support Geisler's allegations. Geisler, a 47-year-old nurse at the University of Texas M.D. Anderson Cancer Center in Houston, acknowledged that the pistol that killed her ex-husband had come from a zippered case in her bedroom closet. She was not charged. Hawkins said that, according to investigators, the boy put the pistol in a backpack and sat in the back seat of the SUV until his father got in. He fired one shot through the backpack into the driver's seat, investigators said, then fired three more with the gun out of the backpack. The boy then went into the house holding the gun, Hawkins said, but his mother told him to go back outside. He then fired nine more shots while standing outside the car. Lohstroh was hit five times in the back and once in the left arm, authorities said. Geisler testified that she did not notice the pistol when her son came into the house after the first shots were fired, Hawkins said. When asked whether Geisler is being investigated for a possible role in the shooting, he said, "I can't comment on pending investigations." Family violence arrestsAt different times during the marriage, Lohstroh and Geisler were arrested on family violence charges. They divorced in May 2003, but the animosity continued. She later reported to police in Webster and Friendswood that her older son, then 8, said his father had molested him. Police investigated, but the district attorneys' offices in Harris and Galveston counties refused to accept charges. The parents had joint custody after the divorce. The boys remained in Friendswood schools, but shuttled between their father's home and their mother's new home in Katy. After Lohstroh's death, a Galveston court granted custody of both boys to the Greenes, who moved to Friendswood from Columbia, S.C. The younger boy lives with them. "He's doing well," said Richard Greene. "He has difficult times ahead. He misses his daddy very much." 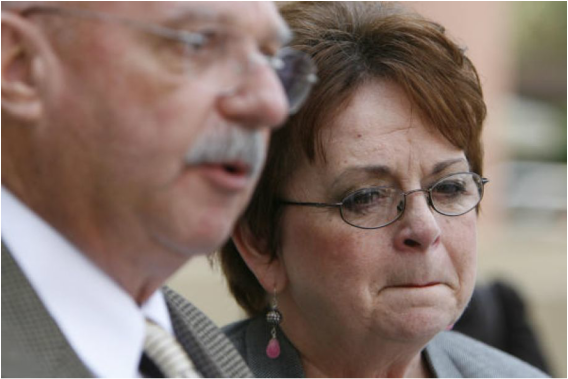 The Greenes' wrongful-death lawsuit against Geisler and Swanson is set for trial in December. The complaint also names the pharmaceutical companies Eli Lilly and Co. and Mallinckrodt Inc., alleging that the older boy's use of the antidepressant fluoxetine, commonly known as Prozac, created a state of "agitation, depersonalization, hostility and mania leading to violence. ... "
Geisler said her son was still piecing together happened at the trial, struggling to understand. When she spoke to him Thursday, she said, he asked her to bring Chinese food and chocolate during her next visit. "He knows very little about where he is going to be going," she said. Houston Chronicle reporters Zeke Minaya and Armando Villafranca contributed to this report. The boys attorney attempted to release the teen to his maternal grandmother while an appeal was in process. The mother, Deborah Geisler argue that she would rather leave her boy in prison than have him released to her mother. "Tritico also said he was offended that Deborah Geisler would argue to leave the boy in prison until she can persuade the judge that he should live with her. Tritico also said he was offended that Deborah Geisler would argue to leave the boy in prison until she can persuade the judge that he should live with her. Tritico said he had worked for years to secure the boy’s release and Geisler’s actions undermined the cause."